New Horizons continued his good form with a slashing win in the 1300m Pacifica Trading Seafood Specialists Class 2 Plate at the Gold Coast. Jockey, Tegan Harrison, was able to jump and have him just behind a solid pace in the run. Turning for home she then allowed him to stoll up to the leaders before kicking at the 150m mark and streaking away for a 4 length victory. "This guy just keeps improving every time he steps out and continues to progress. We will just keep him going through his grades and we are confident of him stepping up each time we raise the bar. Tegan knows him very well and rode the perfect race today. He has a tendency to switch off when he hits the front, but is now becoming aware that he needs to keep going. So it was very nice to see him run away from the field today. 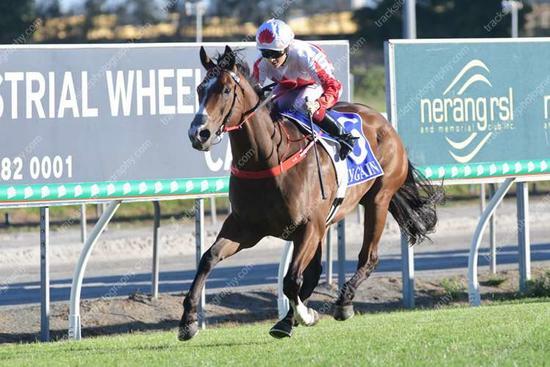 We really have to thank Paul Fudge and Luke Geddes from Waratah Thoroughbreds for entrusting this immaculately bred horse to us and are confident there will be more wins in store for him. A big thanks to all the staff in Brisbane who continue to do a magnificent job with the horses in the stable there." Commented Andy Kermond, Brisbane Foreman.